Srinagar is an extremely compelling honeymoon destination and nature’s beauty and other alluring attractions are in abundance here. Lovers have the option of holding hand in hand and walking over the area surrounded by blossoming flowers, maple trees and enthralling fountains. Or else there exists the beautiful Dal Lake that is an amazing sight to behold. 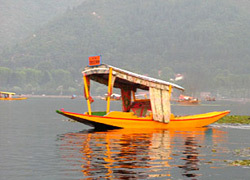 Another lake called the Nagin Lake, which is significant part of the Dal Lake continues to attract tourists. Over Dal Lake, as you go for your boating excursion, you come across numerous hawkers intending to sell handicrafts as well as soft drinks. In order to add a bit of adventure to your honeymoon, you both must head towards the Gulmarg Biosphere reserve and the Dachingam National Park, where you witness a nice blend of nature and beauty. Another interesting spectacle to witness in Srinagar is the beautiful River Jhelum. Khir Bhawani Temple and Hazratbal Mosque are the sites showcasing religious significance. And an amazing historical sight that deserve your visit is the Hari Parbat Fort that add to the list of attractions that Srinagar has in its lap for you. Accommodation of 04 nights on double /Twin Sharing basis as mentioned above. Airport transfers by Non A/C Cab. Sightseeing Tours/Excursion as per itinerary by Non A/C Cab. Meeting & Assistance on Arrival by our Rep.
One time candle light dinner at Houseboat. Daily Buffet/ fixed Menu breakfast and Dinner at Deluxe Houseboat in Srinagar. Daily Buffet/ fixed Menu breakfastonly, in hotel in Pahalgam and Srinagar. Shikara Ride on DalLake for 2 – 3 hrs. One full day excursion tour of Gulmarg. Candle light dinner at Houseboat. A honeymoon cake in Srinagar. Daily Buffet/ fixed Menu breakfast, only in hotel in Pahalgam and Srinagar.